Choosing a name that can be used for future figures with the same power is something I like to do as well, but let's also remember that Kaemon Awa's Quick Strike and Major Q10's Wrist Rocket are the same exact Special Attack, so it's not exactly the end of the world if another custom uses Man of Steel, but calls it something else. EDIT: I know the card's a bit 'loose', I just figured there'd be revisions soon! This is one of those cards I like so much, I'm going to have to take a photo of the mini. The stock picture is terrible! EDIT: Make sure you check out the UPDATES to Copperhead and Blazing Skull on the previous page, MH! I'm sure Grey Owl has a Mighty Mouse tucked away on some thread somewhere right before Underdog and after Courageous Cat. Veeeery funny! I don't think I'll be doing any Disney customs soon, though. Superhero and Star Wars keeps me busy enough, though if anyone ever came out with G.I. Joe miniatures I'd be all over them!! Aww man, GI Joe minis in the right scale would be AWESOME!!! Hopefully the upcoming film will yield some kind of licenced game with appropriately sized figures... but the movie liiks kinda terrible IMHO. Long live the 80's Joe cartoon and the Marvel Comics series! And he brought forth such great gifts in the form of beautiful army cards. So why did it take me soooo long to notice. Oh yeah, my turn to be ultra busy with work again. Anyway those cards look great. Thank you partner. I'm glad you're happy with the way Wonder Woman came out. I think she looks sweet. Now I just have to get that mini. I do see what you mean about the pic of the mini. You're background is so vivid that a less than perfect picture makes her seem out of focus a bit. I agree, either take an actual photo of the mini, or if there is a way to dull the viberance of that beauty of a background, you may be able to get the same result (but then again, I'm no artist). Copperhead definitely looks better. I don't know if the background I gave you is perfect (it was just a suggestion), but definitely it's better. Now to the important one, Superman of the simple playability variety. So what should we do? How do we get Heat Vision to where it satisfies both of us, yet doesn't overpower the card? We'll have to work on that one. And is it just me or does the pic of the mini seem like he's tilting backwards? Maybe that's the effect of him flying or maybe I need my own inner ear checked. That looks like the official pic of the mini from the Wizkids site, and it is a bit tilted. I dunno what program Garada uses to make his cards, but GIMP allows you to rotate layers, so that pic can be easily rotated to a more upright position. I'm sure Photoshop allows this option as well. I'm using PhotoShop, so I can definitely rotate Supes a few degrees clockwise to get him a bit straighter. I didn't really notice it to be honest, I guess I took it as him arching his back to look more cool or something!... Flexing!!! Two tickets for the gun show, anyone? Anyway, I'll do that when I go in for the next wave of revisions. I'm also going to photo WW for sure... give her better lighting and try to make her look a bit prettier! It may be a bit before I get to this, but it will happen. I love WW too much to let her run around looking like a mess! While my creative powers recharge, I've completely simplified my proposed "Original Torch" and Toro. Please check them out to see if they are worthy of the Garada treatment. EDIT: And we could also use some costing input on Wonder Woman. Last edited by Matt Helm; August 10th, 2009 at 06:36 PM. Since simple is my theme of the day, I got to thinking about some characters that would usually be undoubtedly complex when replicated in Heroscape. My kids love the Justice League and I already worked with the G-Man on Superman and Wonder Woman. G wants me to consider a simple Batman but I like the C3G card right now so simplifying that may take some thought... or at least a little separation. Anyway, I've always thought that Green Lantern was just too difficult to capture. Never mind that there are soooo many GL's to choose from and I know that most comic custom creators want a different card for each. Well I thought that Mr. Simple (AKA Matt Helm) shouldn't roll that way. I don't have time to create a bunch of GL's with distinctions that are fun enough to want the whole Corps in the game. I also don't have the money to track down all the minis. In fact, I don't have any GL minis so I'll have to start looking into that. Anyway, I got an idea as to how to replicate the complexity of the ring. Since it is only bound by imagination, and I don't like peripheral cards, I decided to use my imagination to tap into the cards already in the game. I figure this will make the ring imaginative but at the same time box it in enough to keep playability simple. Let me know what you think (and if Garada is up for the challenge, he can pick a mini to represent the "simple and generic" Green Lantern). 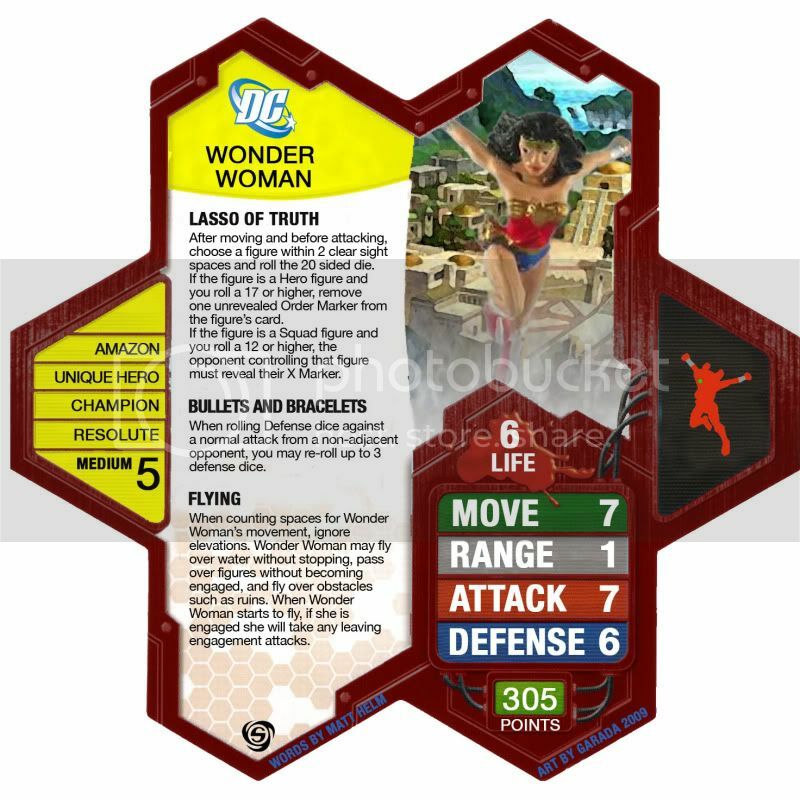 Green Lantern may mimic any Special Attack listed on an opponent’s army card. Choose any opponent’s card and follow a single chosen Special Attack as if it were on this card. 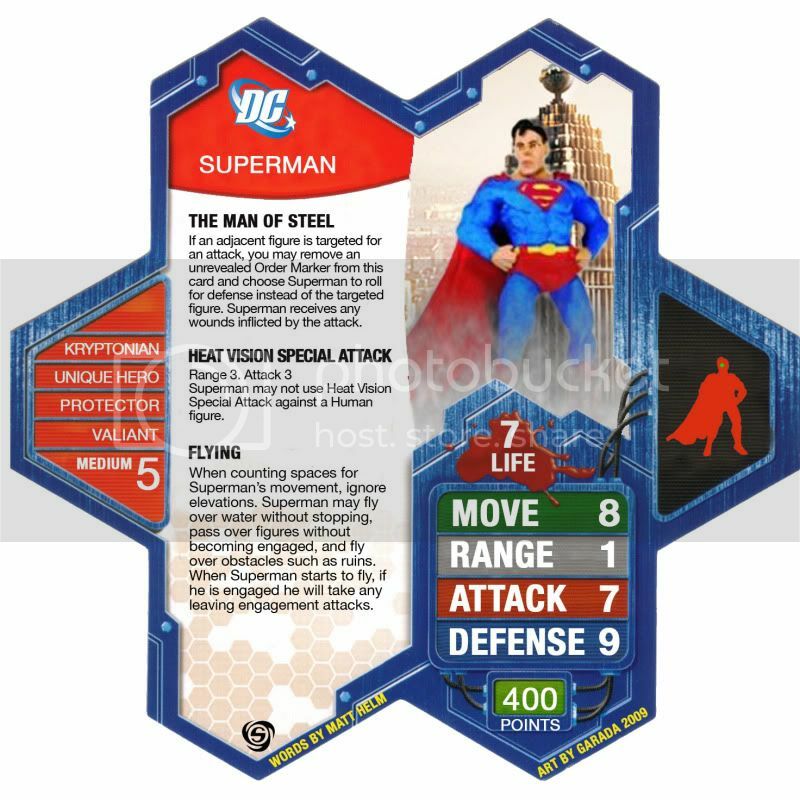 When Green Lantern, or any figure you control that is adjacent to Green Lantern, rolls defense dice against a normal attack from a non-adjacent opponent, add one automatic shield to whatever is rolled. When counting spaces for Green Lantern’s movement, ignore elevations. Green Lantern may fly over water without stopping, pass over figures without becoming engaged, and fly over obstacles such as ruins. When Green Lantern starts to fly, if he is engaged he will not take any leaving engagement attacks. EDIT: For survivability, maybe we should increase the Defense to 5 I think he should at least be usable in the event that the opponent has little to no Special attacks to tap into. But then again, if the opponent has no Specials to help him offensively, they will likely have to rely on normal attacks which will make his Force Field kick in on the ranged ones. Oh I'm so torn ---- I need Garada to make the call. Last edited by Matt Helm; August 11th, 2009 at 09:47 AM. The verry thought makes me tingly. God makes us strong for a little while so we can defend the weak.